Dendrobium orchid, from our DENDROBIUM collection FREE! Enter delivery date . .. Experience three months of our Lily collection. Each month will bring a new variety and wonderful color for you to enjoy. 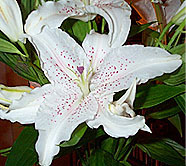 The Lilies that will arrive on your doorstep are some of the most beautiful and fragrant Oriental and South American wild lilies available today. As sophisticated and elegant as the orchids, the luscious purple shades of red, pink and white are simply breathtaking to admire. The subtle yet exotic scent of these flowers are unmatched by any other flower we have encountered. 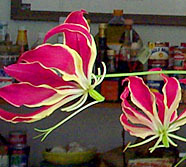 Wild Lilium - the epitomes of luxury and high style. 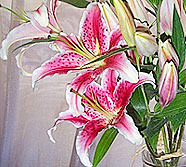 The arrangement above was created with freshly cut Wild Lily in our own vintage Artisan vases. Each purchase includes care instructions and an exquisite gift card for your personal message. Fed-Ex Overnight shipping included.